Easy checklist (totally FREE as well!) of 28 things to remove from your home and life in February. Take the month one step at a time and declutter one thing each day from your home and life. Get things sorted, one step at a time, and enjoy a more clutter free home. This is the second part of my 12 part series of free decluttering printables this year – all based around the popular post – 365 things to declutter from your home and life this year. You can choose how you do things with each monthly declutter checklist (which you can grab NOW in the Printables Library). Either do it all on one day in a blitz session, or take it slowly and declutter one item a day on the date the checklist suggests. It really depends on what time you have available, and how you like to do things (as always!). Without further ado, let’s get on with February’s declutter, shall we…. This is always a good one, because there are so many clothes in most of our wardrobes that we look past each and every day because we know they don’t fit. Whether you’re waiting to lose weight to fit back into them, or whether you are hedging your bets with some larger clothes – chances are when you fit them you won’t want to wear them again anyway – so why not let them go to a charity shop so that others can get use out of them right now? TIP – The only clothes you need to keep that don’t fit are if you are currently pregnant or have just had a baby, or are actively losing or gaining weight and know that you will need them soon. They seem to breed in my house! – Having a tech loving hubby there always seems to be another phone or gadget that comes with a wire/charger etc…. Go round your house and gather them altogether. Work out what you use, and ideally label each one with what you use it for (so you don’t have an issue again! ), then get rid of what you don’t use. Easy! Borrowed a book, an item of clothing recently? Time to give it back and free up the space! I like this one because it’s a little out of the ordinary for a declutter list. I want to declutter the time spent preparing food in the kitchen, so take time next time you cook to batch cook double of that meal and freeze it. Next time you need to cook that meal it will take so much less time – you’ll be hooked! When me and my hubby got together we found that we had several of the same books (similar tastes! ), and when my Mother in Law passed away we kept some of her books that were also duplicates. No home needs more than one of any book – so we sorted them and kept the one that meant the most and/or was in the best condition. Chances are you have added a LOT of people over the years who you don’t really know or see any longer, so now is the time to declutter them. Look at your recorded films on your TV – I bet there are a few that you recorded ages ago, have watched, but never got round to deleting. Free up the space you have and get rid! This is a good one at this time of year because chances are you will have received at least one gift pack of toiletries for Christmas. Most of these are great, but tend to have at least 1 item that you never get round to using, that gathers dust. Either put them in your gift area to re-gift to someone (note who gave it to you so you don’t give it back! ), or give to charity. Let someone else get the benefit rather than them sitting on your shelf for years. The last time you baked was probably for an event of some kind. As such you will have got icing or decorations for it that you used once but won’t use again – so why keep them? These are things like paint brushes or rollers that you won’t use again because you don’t plan to decorate a room in the near future. Or specialist paint for doing a DIY project. Whatever supplies you have but won’t use again – get rid. You can always get a copy from your supplier if you ever need it – but I’ve never know a reason why you would! – Recycle (and shred) all but your latest bill. Extra points if you can go digital with your billing because that declutters things even more! #14 – Chargers for things that you don’t know what they charge! #15 – Product guarantees that are expired or that are for products you don’t own anymore. There will always be things that you added once upon a time to your list that you wanted or needed to do at that time, but have now been outdated. Either because your feelings have changed towards doing it, or they have been taken over by something else. If you want to have a keepsake, then take a photo/scan it, but get rid of the paper asap. As with #17, if you really want to keep any you can take a photo or scan it. I usually only keep the actual cards when they are truly sentimental. Even though I fully support the idea of re-gifting the bags you get presents in from people, don’t keep any that are damaged as they just don’t look good. You don’t need that in your life. I am thinking here of items you may have inherited but really don’t like, or items that hold bad memories that you would be better off forgetting rather than being reminded of them all the time. Think also of getting your news from a website in the future to save paper clutter. They don’t look nice, and don’t feel as cosy underfoot – so declutter them! They take up far too much room, and have probably been at the back of a cupboard for a LONG time! 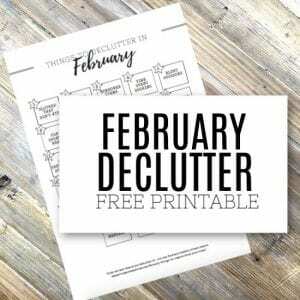 Your very own copy of the ‘February Declutter Checklist’ is waiting for you in the Free Printables Library. To get FREE access to the entire library simply click the button below – hope you enjoy! There you have it – 28 things to remove from your home and life in February – AND a Free Checklist to stay on track. The best way to stay on track all month and get a bit done each day. I hope you have fun with this list, and that you join me next month for March’s checklist (and if you can’t wait until then, remember that the entire list is written out HERE). …By the way – although this declutter checklist is a fantastic one to follow if you like working by yourself, you may be someone who likes to have extra help and support to make sure you get things done. As such, I created a totally FREE 30 day clutter challenge, which you could join now. It gives you an email a day with a small challenge in, and you can join over 400o people who have already done it. You can find out all the details HERE).